The second of three images of ESO's GigaGalaxy Zoom project has just been released online. It is a new and wonderful 340-million-pixel vista of the central parts of our home galaxy as seen from ESO's Paranal Observatory with an amateur telescope. This 34 by 20-degree wide image provides us with a view as experienced by amateur astronomers around the world. However, its incredible beauty and appeal owe much to the quality of the observing site and the skills of Stéphane Guisard, the world-renowned astrophotographer, who is also an ESO engineer. This second image directly benefits from the quality of Paranal's sky, one of the best on the planet, where ESO's Very Large Telescope is located. In addition, Guisard has drawn on his professional expertise as an optical engineer specialising in telescopes, a rare combination in the world of astrophotographers. Guisard, as head of the optical engineering team at Paranal, is responsible for ensuring that the Very Large Telescope has the best optical performance possible. 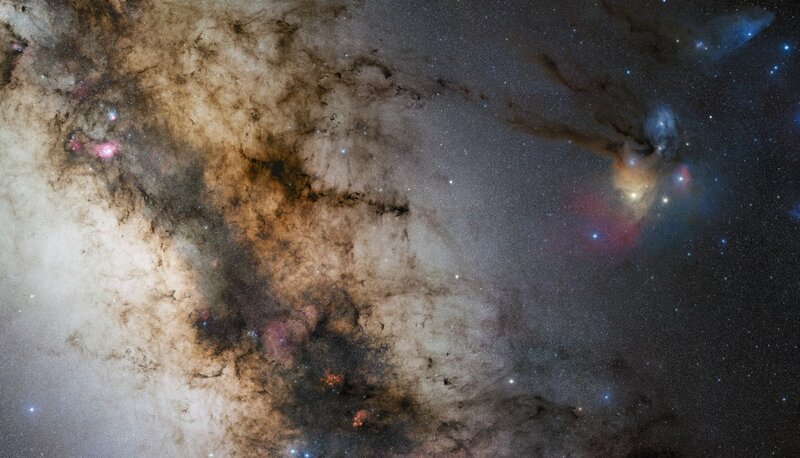 To create this stunning, true-colour mosaic of the Galactic Centre region, Guisard assembled about 1200 individual images, totalling more than 200 hours of exposure time, collected over 29 nights, during Guisard's free time, while working during the day at Paranal . "The area I have depicted in this image is an incredibly rich region of the sky, and the one I find most beautiful," says Guisard. This gorgeous starscape is the second of three extremely high resolution images featured in the GigaGalaxy Zoom project, launched by ESO as part of the International Year of Astronomy 2009 (IYA2009). The project allows stargazers to explore and experience the Universe as it is seen with the unaided eye from the darkest and best viewing locations in the world. 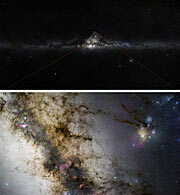 GigaGalaxy Zoom features a web tool that allows users to take a breathtaking dive into our Milky Way. With this tool users can learn more about many different and exciting objects in the image, such as multicoloured nebulae and exploding stars, just by clicking on them. In this way, the project seeks to link the sky we can all see with the deep, "hidden" cosmos that astronomers study on a daily basis. The wonderful quality of the images is a testament to the splendour of the night sky at ESO's sites in Chile, which are the most productive astronomical observatories in the world. The third GigaGalaxy Zoom image will be revealed next week, on 28 September 2009. The image was obtained from Cerro Paranal, home of ESO's Very Large Telescope, by observing with a 10-cm Takahashi FSQ106Ed f/3.6 telescope and a SBIG STL CCD camera, using a NJP160 mount. The images were collected through three different filters (B, V and R) and then stitched together. This mosaic was assembled from 52 different sky fields made from about 1200 individual images totalling 200 hours exposure time, with the final image having a size of 24 403 x 13 973 pixels. As part of the IYA2009, ESO is participating in several remarkable outreach activities, in line with its world-leading rank in the field of astronomy. ESO is hosting the IYA2009 Secretariat for the International Astronomical Union, which coordinates the Year globally. ESO is one of the Organisational Associates of IYA2009, and was also closely involved in the resolution submitted to the United Nations (UN) by Italy, which led to the UN's 62nd General Assembly proclaiming 2009 the International Year of Astronomy. In addition to a wide array of activities planned both at the local and international level, ESO is leading three of the twelve global Cornerstone Projects. A native of France, Guisard has worked for ESO in Chile since 1994, and is now the head Optics Engineer for ESO's Very Large Telescope (VLT). 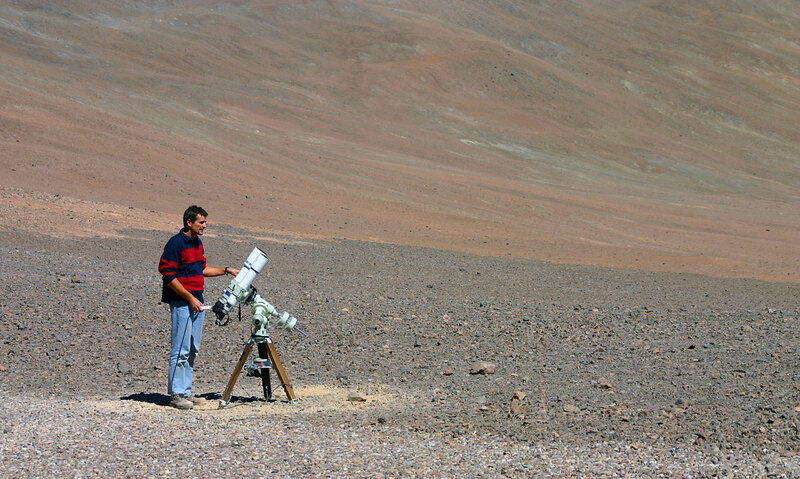 He is in charge of the optical alignment of the Paranal telescopes, as well as maintaining and improving the image quality of these telescopes and their active optics. Stéphane spends most of his free time photographing the night sky, enjoying the same crystal clear skies as the VLT. His fantastic astronomical images and time-lapse movies have been used in many books and TV programmes. Stéphane Guisard is also a photographer for The World At Night (TWAN).